The Center on Human Development and Disability has established 8 Collaborative Research Areas (CRAs). 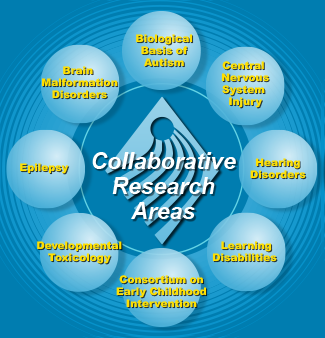 They are cross-disciplinary, emphasize translational research goals, and reflect a significant research investment by CHDD’s Eunice Kennedy Shriver Intellectual and Developmental Disabilities Research Center (IDDRC). Each CRA has a coordinator (or co-coordinators) who encourages research in his or her CRA, strengthens its interdisciplinary components, identifies unique needs associated with each area, adds new members as needed, and makes connections to clinical activities where appropriate. Investigators representing genetics, neuroscience, and behavior participate in each CRA and frequently collaborate on research projects, conduct seminars, recommend new core services, and recruit new members with special expertise. Each CRA includes not only Research Affiliates but also clinicians and trainees.